A friend who lives in Los Angeles visited me a couple of days ago. He was here for less than 24 hours, but we were able to see and do quite a lot, including a trip to Georgia Aquarium. He didn't believe me when I told him that it's the world's largest aquarium, but was convinced after seeing four Beluga Whales, petting sharks, and making photos with a bigger-than-life penguin. 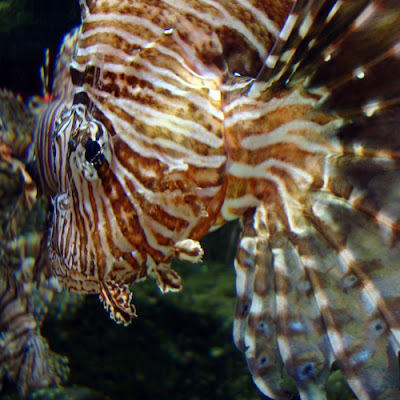 A tank filled with Red Lionfish (pictured here) was one of the many breath-taking exhibits. We also went through the "Planet Shark" exhibit. Although there are no live specimens in the Planet Shark exhibit, it was highly educational and quite interesting.